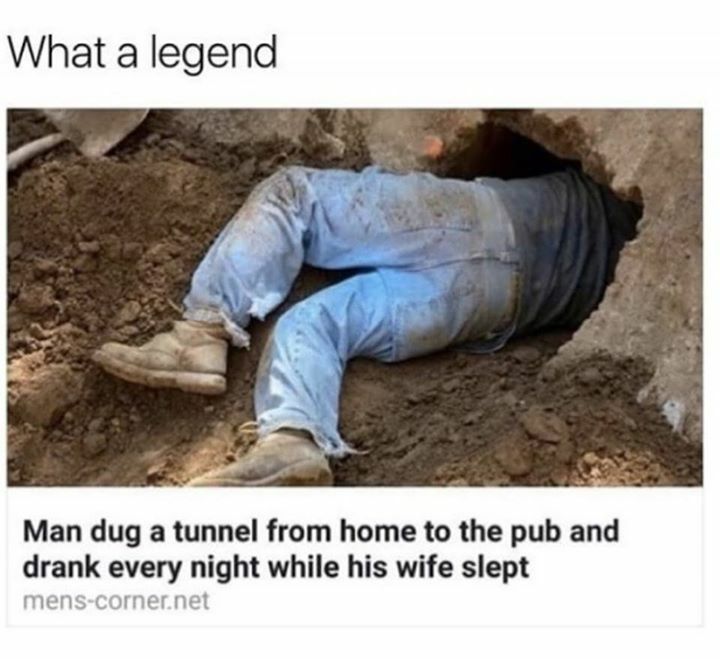 WHAT A LEGEND MAN DUG A TUNNEL FROM HOME TO THE PUB AND DRAN - ProudMummy.com the Web's Community for Mums. Why didnt he just walk there if wife was asleep??? Glenn Thompson. Dig one to the clav? Danny McElhinney this is what ur drinking is coming to. Lilli Rose Janneh Dad ? Ginger Dickson what have you been up too !!!! Richard Wheatley hmmm I'm all of a sudden not being woken up by snoring! Justin French this leads to the sosh! Duncan Timbs now I know ur secret.